Seeing as we’ve heard a lot of good things about this anime, Tyler and I were excited when we stumbled across the English dub on Crunchyroll. After finishing the movie, we understood the description; hearts were broken, feels were felt, and tears were shed. 5 Centimeters per Second is told in three parts, and takes place over a period of years spanning from elementary school, through high school and into adulthood. The movie starts out with the protagonists, Takaki and Akari, looking at cherry blossoms, promising to see them again together some day. Sadly, the two are forced to separate as Akari moves away. They retain contact through letters, which is what drives the dialogue in part one, Cherry Blossoms. Years have passed, and Takaki is now in high school. Kanae, a girl in Takaki’s class, is the protagonist of part two, Cosmonaut. She’s developed serious feelings for Takaki, but is afraid of rejection. Similarly, Takaki finds himself unable to send the drafts of texts he writes to Akari, fearing the same. Kanae eventually discovers her feelings won’t be returned, and Takaki won’t express his. In the final part, 5 Centimeters per Second, features both of our original protagonists, with the communication between them far in the past. Takaki is unhappily unemployed as a computer programmer, while Akari is engaged, with her wedding fast approaching. Takaki realizes he’s unhappy, and quits his job, going out and searching for his purpose and happiness, like the drive he had when he was younger. Akari is happy in the final segment, even after she finds a piece of the past that reminds her of Takaki. Takaki, however, still seems to not be with his life. The end of the movie is an elegant heartbreaking montage of the journey that Takaki and Akari have had through out the movie. Now ! What we actually LIKED about the movie. The way that the themes of distance are portrayed in several different ways made the movie not only visually pleasing but also emotionally… if you like an abundance of feels bombarding your heart like asteroids. The art and film style is SERIOUSLY the only way this overall story could be told, as every single scene of the movie is just as important as the dialogue. AND THE FREAKING MUSIC! Bah … each part of the movie had its own style of music to portray the chapter of life the characters were in. Music was heavily used at the end of the movie to wrap up it all up, which coats on the feels that much more. The movie is highly recommended, this post can’t do justice. Go out. Watch it. Cry. 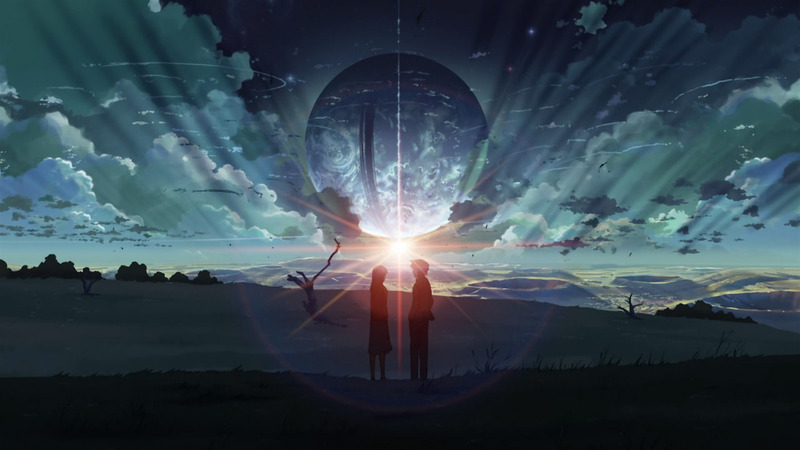 This entry was posted in Review and tagged 5 centimeters per second, Anime, heartbreak, japan, love, review, romance. Bookmark the permalink. Really? The manga has been mocking me to watch the movie and then read it, so that will now happen as soon as possible. How did you not bawl!?! I was rolling on the floor from the overly cute ending of part 1, and then I was a waterfall of tears after that last scene where you hope that she is looking back after the train passed. Aghhh feeeeelsss. . This is a pretty good summary of the film. I agree that the manner in which everything was portrayed was really the only way to make it all work. With respect to Justin’s comment, I can’t say I cried either. Maybe all those horror games have ruined me, but at the time it was more that all of the scenarios I was imagining were going to happen were actually much more depressing than the actual events XD I don’t think i’ve ever really cried during a movie or series; it’s Visual Novels that most often succeed in bringing a tear to my eye. A very manly tear (Not my actual thought, I just kind of wanted to say it =P).